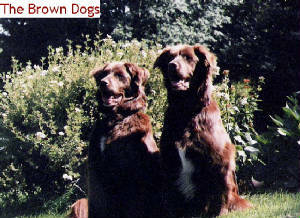 Two Brown Dogs Canine Consultants provide family-friendly education and training for new and experienced dog owners. Whether you have dogs, dogs and kids, want happy friendly family dogs, dogs that will perform in dog sports or anything in between - we can help. Two Brown Dogs has the only Certified Professional Dog Trainers in western Manitoba (in fact between Winnipeg and Saskatoon). Renee Will, owner and Training Director, is also a Certified Behaviour Consultant-Canine. Certification ensures that your dog's trainers are current, knowledgeable in scientific principles of learning and training and are able to assess your dog and tailor training and training plans to your needs. This Web Site is a work-in-progress.